"The Circus arrives without warning...It is simply there, when yesterday it was not." These are the opening words to what will probably be the next phenomenon in Young Adult literature. Released in fall of 2011 The Night Circus has all the necessary elements to captivate its readers as much if not more than The Hunger Games and its other YA/Fantasy counterparts. But if you were overwhelmed by the thousand page series of Hunger Games, or more so the five-thousand pages so far of A Song of Ice and Fire (Game of Thrones), do not fret. At a mere 400 pages of pure delight you'll wish you could stay in the magical world of The Night Circus for just a bit longer. The Circus is all anyone could dream of as children and adults alike marvel at its magnificence. In fact its name is 'Le Cirque de Reves', or The Circus of Dreams. Colored only in black and white, from the numerous circus tents to the performers' costumes and even the caramel popcorn, the circus has all the acts one would expect. Adding to its mystery are the more obscure tents with seemingly impossible magical qualities such as a garden made only of ice that never melts and a merry-go-round with animals that come to life beneath their riders. Underneath this blanket of wonder is a competition set in motion by two men with powerful magical ability. It's done in classic nature vs. nurture, Duke and Duke fashion, but with a twist. The question is simple: Which is more important in performing magic, innate ability or strict academics? Though these magicians have clearly engaged in this same competition before, the details are hazy to the participants, a young girl and boy who by a wager are pitted against each other in a test of magical skills of which they are unaware of the rules, the consequences to the loser, and even the identity of their opponent. 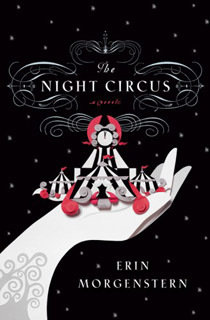 In this, her debut novel, author Erin Morgenstern jumps back and forth through the life of the story to examine the Circus, the wager which prompted its existence and perhaps most importantly the relationships between the circus performers and the circus-goers, whose belief in its goodness keep the Circus alive. Morgenstern makes magic a reality and the Circus come to life in what can be called a fantasy but will have the reader wishing it were real. It's the kind of book that has the ability to put a smile on your face for no reason at all, and possibly the only book that upon finishing the last page I seriously considered going right back to the first and reading it all over again.